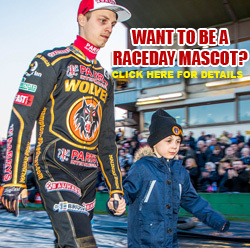 WOLVERHAMPTON battled their way to a 51-38 home win over Belle Vue in the first leg of their Premiership Play-Off Semi-Final - but there's concern over Swedish favourite Jacob Thorssell ahead of Wednesday's return. The 24-year-old was clattered into by visiting rider Rohan Tungate in the penultimate race and was sent crashing into the wooden fence out of bend two, leaving him with pain in his lower back. The incident overshadowed an entertaining clash between the two sides who contested last year's Grand Final. 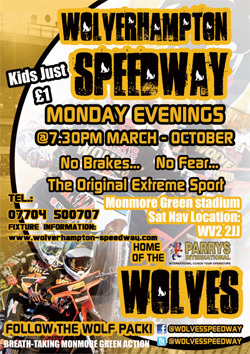 While a Heat Two 4-2 from reserve duo Mark Riss and Nathan Greaves was the only difference between the Parrys International Wolves and the Aces in the opening four races, the hosts powered on mid-meeting to stamp their authority on the tie. Four heat advantages, including three 5-1 maximums, in the space of six heats opened up a 14-point advantage for the Monmore men with ten gone. But Belle Vue closed the gap with two heat advantages of their own before home skipper Freddie Lindgren took the chequered flag in Heat 13 with the scores at 43-35. The re-run of Heat 14 saw Greaves come in for the injured Thorssell, but the youngster came down on bend four limiting the Wolves to a 3-2. But Lindgren and Rory Schlein rode superbly in the final race to work their way past Belle Vue man Steve Worrall as one final maximum ensured the Midlanders of a double figure advantage to take to Manchester on Wednesday. "If somebody would've offered us a 13-point lead at 7:29pm this evening we'd have taken that for sure," Wolves team manager Peter Adams said. "But we were in a much better position at one point where it could've so easily have been even more than that. 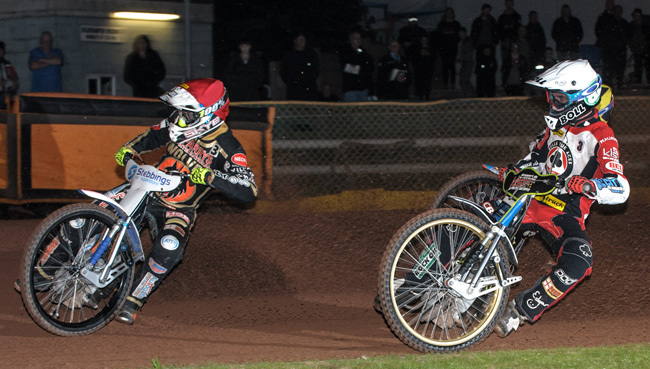 "But credit to Belle Vue for putting up a bit of a fight and they made it difficult for us. 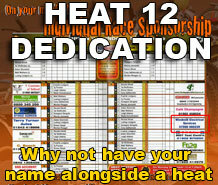 "We lost Jacob in Heat 14 which was a blow for us. "He's complaining of pain and discomfort in his lower back and he's struggling to breathe as well. "He's gone to hospital for x-rays and we'll have to wait and see the outcome of that. "But then I thought Freddie and Rory were fantastic to earn the 5-1 in Heat 15 and who knows how important that could be." Skipper Lindgren stormed to a fully deserved paid maximum while Schlein performed superbly, picking up three race wins on his way to double figures. Mark Riss enjoyed a solid night at reserve while Kyle Howarth recovered from a last place in his opening ride to earn three straight second places. Sam Masters and Nathan Greaves both endured tougher nights while Jacob Thorssell managed paid six before his awkward looking crash. 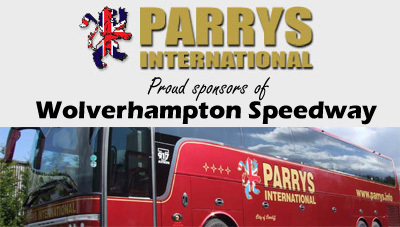 WOLVERHAMPTON 51: Freddie Lindgren 14+1, Rory Schlein 12, Mark Riss 7+1, Kyle Howarth 6+2, Jacob Thorssell 5+1, Sam Masters 5, Nathan Greaves 2+1. BELLE VUE 38: Max Fricke 10, Kenneth Bjerre 8+1, Steve Worrall 7+1, Dan Bewley 7, Craig Cook 4+1, Rohan Tungate 1+1, Rob Shuttleworth 1.